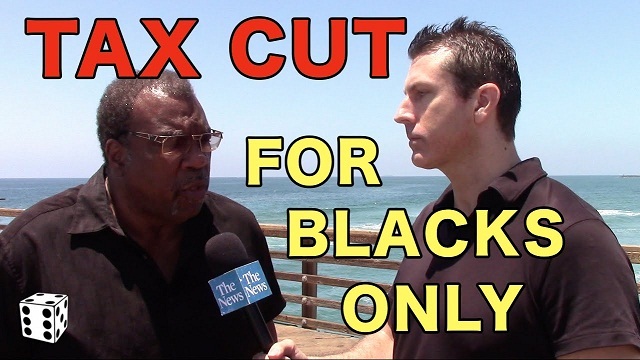 One respondent says tax break a "great thing" because of "all the riots"
Told that President Obama had announced a 10 per cent tax cut for African-Americans and Latinos only, the vast majority of leftists in San Diego agreed with the policy. Another woman said the policy was a “great thing” because of “the judicial system and the whole cop situation and all the riots you’ve been having,” suggesting that it was a good idea to reward rioters in places like Milwaukee and Baltimore. Another hipster-looking man said a 10% tax cut for blacks was “the least we can do” as well as “a step in the right direction,” and that a tax break in excess of 10% would not be unjustified. “Three words – black lives matter,” responded another individual. “Since I’m basically Mexican, I think it’s pretty much a good break, I mean for people that doesn’t make that much money – it’s really good,” adds another. An older white man agrees that the tax break policy is a “great gesture for black people,” but that it should probably be 15%, concurring with Dice that taxing white people more would make everyone ‘more equal’. “The government’s heart’s in the right place,” he concludes.